FinnAxia Global Liquidity Management helps banks enable complete visibility into cash positions for their corporate customers. This results in better utilization of available funds and reduced interest costs through short-term bank borrowings. Liquidity Management helps the bank setup and manage complex cash concentration and pooling structures for automated fund transfer and consolidation within the group. This software automates all transactions, interest & tax calculations and manages a registry of intercompany lending/borrowing history and limits for the corporate. Reduced Operating Costs and enhanced operational efficiency . Maximized interest income though automatic funds transfer services with sweep rule engine. The balance to be left on the child account (e.g. zero or pegged/target account balancing). The frequency and timing of sweeps (e.g. intra-day and/or end-of-day; single or multiple events at predetermined times). The layering and sequencing of the sweep activity, i.e. single or multiple levels sweeps. Parameterized Interest calculation, Distribution and Reallocation options to maximize interest for corporate. 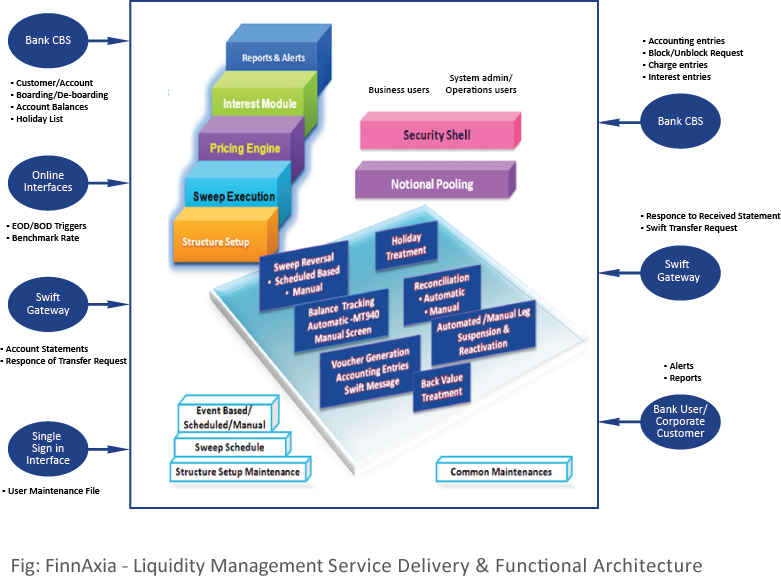 FinnAxia Liquidity Management supports setting up and execution of Hybrid Structures. In Hybrid Pooling – both notional pooling and sweeps can be used together to maintain credit and debit positions of various accounts in the book of the bank. The funds consolidation happens in respective header account of the participating subsidiaries of corporate through sweeps; (Parent- Child relationship along with rules). The header accounts in each country then participate in the notional pool structure as a participant. Account balances get notionally pooled and interest calculated is reallocated as per the model selected.